Kenya is a republic with an executive president. The president is head of state, head of cabinet and commander-in-chief of the armed forces. The constitution, in force up until August 2010, has been amended many times since the republic was first formed in 1964. It provided for a unicameral National Assembly consisting of 210 members. Representatives were to be elected for up to five years from single member constituencies on the basis of proportional representation, with an additional 12 non-constituency members to be nominated by the president. The president was to appoint the vice-president and cabinet members from the National Assembly. The attorney-general and speaker were to be ex-officio members of the Assembly. The president was to be directly elected and limited to two five-year terms. 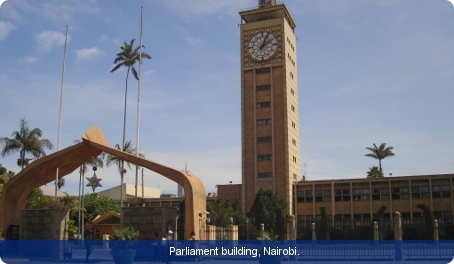 In August 2010 a new constitution was endorsed by the electorate in a national referendum, and was approved by the National Assembly. Many of the details have not yet been decided upon. Thus far, the new constitution provides for reduction of the president’s power, abolition of the post of prime minister (after the next election), an expanded National Assembly (to 350 members), the creation of a senate, significant devolution of power to new country authorities (to be overseen by the senate), recognition of faith courts, a bill of rights,creation of a supreme court, a new anti-corruption agency and an independent land commission to promote land reform. The new constitution promulgated in 2010 provided for an independent judiciary and a Supreme Court. The chief justice is the president of the Supreme Court, which comprises the chief justice, deputy chief justice and five other judges. It has sole jurisdiction over cases concerning presidential elections and it is the final court of appeal. The chief justice is the head of the judiciary, and is appointed by the president on the recommendation of the Judicial Service Commission, subject to the approval of the National Assembly. The High Court deals with the most serious cases under civil and criminal law, as well as appeals from the lower courts. The High Court is based in Nairobi and has resident judges in cities and towns across the country. Less serious cases are heard by magistrates. Appeals from the High Court are heard by the Kenya Court of Appeal which comprises at least 12 judges. The new constitution recognises Kadhi courts to administer Islamic Law. Archaeological evidence suggests that Kenya may be the birthplace of the human race, as 3.25 million years ago the Rift Valley was the home of Homo habilis, from whom Homo sapiens descended. A British protectorate was declared in 1895 over what is now Kenya and Uganda. Following a survey made by Lord Delamere, European and European-descended settlement took place until the start of the 1914-18 war. The efforts of pro-independence parties in the period after the Second World War, together with the repercussions of the Mau Mau rising, led to Kenya’s attainment of independence in 1963. Jomo Kenyatta, leader of the Kenya African National Union (KANU), became the first president of independent Kenya. He remained president until his death in 1978. In 1966 Oginga Odinga resigned from the vice-presidency to form the Kenya People’s Union (KPU). Under the presidency of Daniel arap Moi, successor to Kenyatta, numerous constitutional amendments were made. The secret ballot, for instance, was reintroduced in 1990. Several new opposition parties to KANU emerged in the multiparty elections in 1992, such as the Forum for the Restoration of Democracy (FORD-Kenya). KANU led by Moi won against a divided opposition. In 2001 Moi forged the country’s first governing coalition when he appointed to cabinet two members of the opposition National Development Party (NDP). In 2002 Uhuru Kenyatta, son of Kenya’s first president, emerged as KANU’s presidential candidate. Moi, who had since 1978 been both president of Kenya and leader of KANU, was obliged by the rules of the constitution to stand down as president by the end of 2002. However, Uhuru Kenyatta lost the 2002 presidential election; it was won instead by Mwai Kibaki, the candidate of the National Rainbow Coalition (NARC). The 2007 presidential elections created a degree of political and civil unrest. The opposing leaders eventually agreed to work together in a power-sharing coalition government with Kibaki of NARC as president and Odinga (son of Oginga Odinga) of the Orange Democratic Movement (ODM) as prime minister.